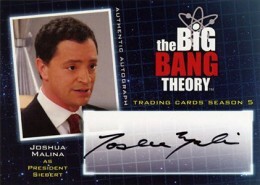 The first batch of 2013 Cryptozoic Big Bang Theory Season 5 Autographs has been announced. 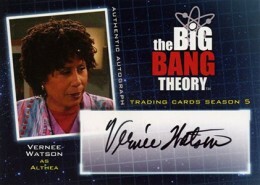 Although this initial group is filled with recurring characters and guest stars, there are a few notable names. 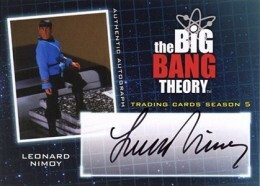 Leonard Nimoy is no stranger to trading card autographs. 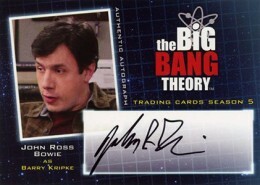 Having played Spock on the original Star Trek, he's one of the most recognizable faces in TV history. His Big Bang Theaory Season 5 Autograph isn't your typical Leonard Nimoy card, though. Rather than picturing the actor, it shows his Mego action figure. It may not be for everyone, but there's no denying the fun behind the card. 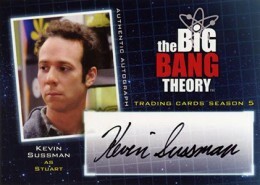 Plus, it becomes an instant must-have for many Star Trek collectors as it has the direct tie-in. 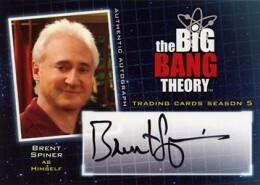 Another Star Trek-related signer is Brent Spiner who is best known for playing Data on Star Trek: The Next Generation. 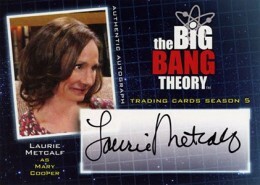 The 2013 Cryptozoic Big Bang Theory Season 5 Autographs checklist has a few repeat signers from past sets including Laurie Metcalf (Mary Cooper), Kevin Sussman (Stuart) and John Ross Bowie (Barry). 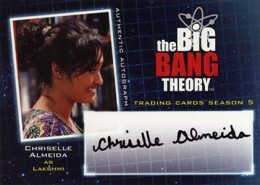 It's important to note that this is only the first batch of confirmed signers. Just because lead actors haven't been announced yet, it doesn't mean they won't be included. They may not, but nothing has been finalized. Insertion rates haven't been finalized yet either. 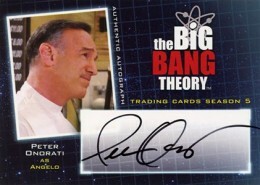 The design of the cards is new from both the Seasons 1 and 2 and Seasons 3 and 4 sets. It's back to a horizontal layout that's complimented by an outer space/graph sort of look. 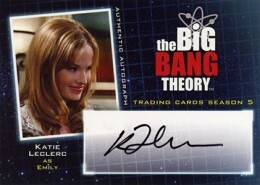 2013 Cryptozoic Big Bang Theory Season 5 is slated for release later this year. Please note this is just a list of confirmed signers. More will be added when they're announced.